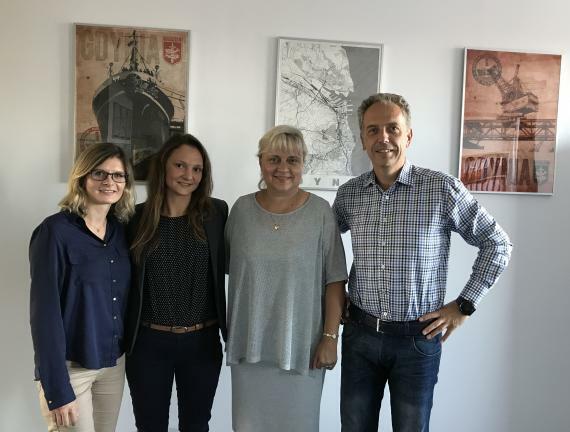 Eurogate Logistics in Poland are pleased to report the President of Global Cargo Canada, Margaret Janczak has visited their office in Gdynia. During the visit at the end of August, the two UFO partners spent the whole day discussing business and life helping to strengthen their professional and personal relationships. Pictured right is a photo from the day featuring from left to right: Angelika Najdowska (Eurogate Sea Department); Magdalena Michalak (Eurogate Sea Department); Margaret Janczak (Global Cargo Canada President); and Grzegorz Ocipka (Eurogate Managing Director). The UFO Head Office is very pleased to see our valued members meeting face-to-face and cementing firm relationships! Remember to register for our 2018 Annual Meeting taking place in Vietnam on 13-15 May providing an excellent opportunity to meet with fellow members. "It was my great pleasure to meet our partner Eurogate at their office in Gdynia during my trip to Poland. I would like to express my special thanks to Mr. Grzegorz Ocipka, Managing Director of Eurogate, who arrived from Warsaw especially for the occasion to introduce me to his Gdynia team personally. In fact, this introduction was made a long time ago during our regular business dealings by sending emails and making phone calls so I was very happy to see the entire team face-to-face and to personally thank them for their dedication and fantastic service. During our meeting, I had a chance to speak with their ocean, air and trucking divisions, learning more about Eurogate's accomplishments and their success stories. The Eurogate office is located in the heart of Gdynia port and through their office windows, I could see the loading of vessels at my fingertips. After working hours, we celebrated our business relationship and friendship by having a great dinner with Angelika Najdowska, Magda Michalak and of course Grzegorz Ocipka at the most elegant beach restaurant in Gdynia. Thank you to Grzegorz, Angelika, Magda and all at Eurogate for your great hospitality and making my visit a memorable experience. I had a wonderful time!" "It was a big honour for us to host Margaret at our office in Gdynia and we very much enjoyed the lovely day. Even though we have known each other for a number of years now, I am sure the meeting will help to strengthen our relationship. Logistics relies on people and relationships are key. Many thanks to Margaret for her time and we hope to meet again soon!"